I recently heard an expression I'm pretty sure I'd never heard before. A few of us were talking about gardens and harvesting, and one friend said, "I'm going to do down some tomatoes this weekend." So we went on to have a lively little conversation about preserving garden produce in hot, sealed jars, a common autumnal activity here on Manitoulin Island and many rural places. 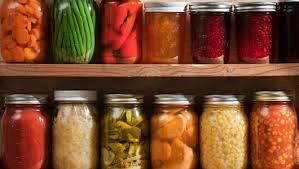 As I drove home, that conversation inevitably led me to think about other expressions for preserving food at home. I thought of "canning" and "do up." And, frankly, since I don't know of anyone within two lifetimes who has ever preserved their garden produce in cans (large companies do, but not usually individuals anymore), I've sometimes jokingly thought we should really call it "jarring," since we use class jars. As in, "I'll be busy all weekend jarring my tomatoes and peaches." But that makes it sound like I'm giving my produce some kind of shock, and, well, that just wouldn't be nice. So, whether you do up, do down or can, I hope you'll end up with a few tasty, colourful jars full of summer warmth and sunshine in your cupboards this fall.